From History of Tioga County, Pennsylvania. Harrisburg, PA: R.C. Brown, 1897. Reprinted Salem, MA: Higginson Book Company. pp. 1140-1154. Aaron Bloss, the founder of Blossburg, was a native of Killingby, Connecticut, born May 29,1775. His father , Samuel Bloss, was a great-grandson of Edward Bloss, who came from England to America about 1630. Aaron came from Chenango county, New York, to Tioga county, Pennsylvania, in July 1801, and was one of the first settlers of Covington township. The following year he removed to “Peter’s Camp,” a station on the Williamson road, now the site of Blossburg, where he erected a house in which he conducted a hotel until 1820. In that year he built a larger hotel and continued the business up to 1835, when he returned to Covington, and died March 24,1843. Mr. Bloss, married Ruah Lownsbery, to whom were born nine children. Four of these grew to maturity, as follows: Everett W., Lloyd. Eliza and Caroline. Mrs. Bloss died April 17,1839, ages sixty-seven years. Mr. Bloss was a man of strong common sense, great determination and courage, an expert woodsman and hunter, patient, shrewd and far-seeing. Such was the pioneer of Covington and Blossburg, the first man to settle in the unbroken wilderness then covering this section of the county. Singerland; Randolph F., who died on the old homestead; Warren W., deceased, and Clara A., wife of John Everett, of Covington. Mrs. Bloss was born in New Hampshire, May 27,1807, and died in Covington, at the home of her daughter, Mrs. Clara A. Everett, September 16, 1887. Randolph F. Bloss, eldest son of Everett Winter Bloss, and grandson of Aaron Bloss, was born in Blossburg, Tioga county, September 6,1830, and was nine years old when his parents removed to Covington township. In 1855, he married Mary Feritor, a native of Ireland, who bore him two children, viz: Edie R., born August 8,1861, who married J.D. Burr, of Blossburg, and died August 14,1895, and Myrtle E., born April 5,1867, who from early womanhood was a great sufferer from spinal disease, and died February 1,1895. Both were earnest Christian women. Mr. Bloss was a member of the Methodist Episcopal church, and in politics, a Republican. He died on the homestead in Covington township, October 3, 1896, aged sixty-six years. David Clemons is acknowledged to have opened the first coal mine on Bear creek, at Blossburg early in the present century, hauling an occasional load of coal overland to Painted Post. He was born on the banks of Lake Champlain, in Vermont, a son of Thomas Clemons, and received a good education. In early life he followed school teaching , and married a Miss Mallory, who died in Vermont in 1803, leaving three children, Camelia, Colburn and Alanson. In 1806 he came to Tioga county, Pennsylvania, and settled about three miles above the site of Covington borough, on the farm now owned by W.J. Richards. Soon after locating here he married Ruth Reynolds, also a native of Vermont, who became the mother of Five children, viz: William, Deceased; Susan, who lives with her sister, Mrs. Ames in Covington township; Cuyler, deceased; Roxanna, widow of Horatio W. Ames, and James, a retired farmer of Covington township. Besides operating in coal to some extent, Mr. Clemons also cleared and improved a small farm, upon which he resided until his death, in 1833. Alanson Clemons , youngest child of David Clemons’ first marriage, was born in Vermont, April 2,1803, and was but about three years old when his father located in the forest then covering Covington township. He remained with his father until twenty-three years of age, when he bought a farm west of the river, on the present Copp Hollow road, where he cleared and improved some 200 acres, being one of the successful farmers of the community. He married Luthania, a daughter of John Copp, who became the mother of ten children, as follows: Sally A., widow of Andrew J. Clark, of North Dakota; Lucy, deceased wife of G.M. Butler, of Covington township; Thomas, a resident of Blossburg; Holland, George, and David, all farmers in Covington township; Orrin, who died in infancy; Laumon, a contractor of Blossburg, and Nelson N. and William S., farmers of Covington township. Mr. Clemons and wife were earnest workers in the Christian church. He died February 2,1867, and his wife, October 17,1880. Holland Clemons, second son of Alanson Clemons, and grandson of David Clemons, the pioneer was born in Covington township, Tioga county, August 10,1834, and is one of the prominent and successful farmers of his native township. He remained on the homestead farm until twenty-one years of age, and then bought fifty-six acres of his present place, to which he has since added, until he is now the owner of 122 acres of well-improved land. On April 17,1858, he married Martha Walker, a daughter of Lewis Walker. She was born in the Frost settlement, June 27,1830, and is the mother of two children, viz; Frank L., born February 14,1862, who died March 29,1891, leaving a widow, Mrs. Ida (Ely) Clemons; and Mary I., wife of W.H. Olney, of Mansfield, who has three children, Charles H., Frank L. and Dee H. Frank L. Clemons was educated at Wellsboro, graduating in the class of 1881, and was soon after appointed deputy sheriff. He served in that office eight months, after which he taught two terms in the home school, and then became principal of the Covington graded school. He subsequently became book-keeper and paymaster of the Cedar Run Tanning Company, at Leetonia, and two years later store manager. He had been a promised the appointment of superintendent of the Leetonia plant, but death cut short his promising career. Mrs. Holland Clemons is a member of the Church of Christ. In politics, Mr. Clemons is a Republican, has filled the office of treasurer, school director, assessor and supervisor in Covington township, and is also a member of the Grange. Isaac Walker a native of Shirley, Massachusetts, was born March 18, 1767, a son of Samuel and Mary (Stratton) Walker. His father was born in Massachusetts, August 30, 1721, and was a son of Seth and Eleanor ( Chandler Walker), a grandson of Joseph and Sarah (Wyman) Walker, and great-grandson of Samuel Walker, who came from England to America in 1630, with his father, Capt. Richard Walker, also a native of England, and the founder of this branch of the Walker family in America. Isaac was reared in his native place, and married Polly Porter, of Charleston, New Hampshire. They located at Langdon, New Hampshire, where eleven children were born to them, as follows: Royal, Isaac, Polly, Asahel, Stratton, Luther, Lewis, Roswell, Lydia, James and Cynthia. Of these Isaac, Asahel, Roswell and Cynthia removed from Covington to Illinois. In 1813 Isaac Walker and family came to Tioga county , Pennsylvania, and located on what is now the Charles Howland farm, in Covington borough. Here he passed the remaining years of his life, dying July 25,1839. His wife died March 24,1847, at the ripe age of seventy-eight years. They were among the leading and respected people of the community which they helped to found. Royal Walker eldest son of Isaac Walker, was born at Langdon , New Hampshire, January 14,1796, and was seventeen years old when the family came to Tioga county. He married Rachel Johnson, of Bradford county, and resided on the farm settled by their father during the remainder of his life. To Royal and Rachel Walker were born eight children, all of whom are dead, viz: Samuel S., for forty-six years an engineer on the Erie railroad; Eliza, deceased , wife of Charles Howland of Covington: William who died in Australia; James P., a conductor on the Erie railroad for many years; Henry E., a fireman on the same road, who was killed in a wreck; Elmina, Elvina and Zilphia. Mr. Walker died at Covington October 16,1875, in which place his wife had died August 30, 1842. Stratton Walker, fifth child of Isaac Walker, was born in Langdon, New Hampshire, July 14,1801, and came with his parents to Tioga county in boyhood. He was reared in Covington, and subsequently purchased a tract of timber land adjoining the farm of his brother, Lewis, with whom he made his home while clearing and improving his property. He was a sufferer from curvature of the spine, and consequently never married. He spent his later life with his nephew, Lewis R. Walker, to whom he had rented his farm, and died February 14,1880, in his seventy-ninth year. Lewis Walker, seventh child of Isaac Walker, was born at Langdon, New Hampshire, December 15,1803, came with his parents to Tioga county, and remained working on the home farm until he was twenty-three years old. He then bought 100 acres of timber land two miles east of Covington borough, and building thereon a rude cabin, he took up his residence on his purchase and began the work of clearing and improving it. Mr. Walker became a well-known and successful farmer, a good business man and a highly respected citizen. December 14,1826, he married Isabel Butler, of Vermont, who shared with him the trials and hardships of pioneer life. They became the parents of ten children, named as follows: Elizabeth, deceased wife of Charles Jaquish; Emmeline, deceased wife of J.G. Noble; Martha, wife of Holland Clemons of Covington township; Olive, wife of Charles Marvin, of Bradford county; Lewis R. of Covington township; Ellis, who died at the age of two years; Isaac D., who died at Nashville, Tennessee, July 27,1864, while a soldier in the Union army; Mary J., wife of Benajah Wilcox, of Corning, New York; James, who died in Andersonville prison during the Rebellion and Milton R., who lives on a part of the homestead. In politics, Mr. Walker was a Democrat, and in religion, both he and wife were members of the Christian church. He died June 17,1870, and his wife December 23,1876. Lewis Randall Walker oldest son of Lewis and Isabel (Butler) Walker, was born on the homestead farm in Covington township, Tioga county, December 1,1834. He received a common school education, and remained with his parents until 1861, when he began for himself on a rented farm. In the autumn of 1862 he located on his present farm, then owned by his uncle, Stratton Walker, where he has since been engaged in general farming. On December26,1860, Mr. Walker married Arvilla Wilcox, a daughter of John H. Wilcox. She was born in Delmar township, May 38,1842, and became the mother of nine children, as follows: Henry E., a tinsmith, residing in Corning; James A., a hardware merchant of Woodhull, New York; Isaac D., a farmer of Gibson, New York; Ora J., A farmer of the same place. Eva A., wife of Ralph VanKeuren, of Gibson; Lewis S. who died in childhood; Earl S., a teacher in New York state; Martha A., who is employed in the State Normal School, at Mansfield, and Alfred G., who lives in Gibson. Mrs. Walker was an active member of the Christian Church. She died March 14,1882. Mr. Walker was again Married February 24,1883, to Louisa Miller, a daughter of Isaac Miller, of Potter county, who bore him four children, viz: Porter N. Mary E., Jesse Q. and Randall C. Mrs. Walker died on August 21,1894. She was a consistent member of the First Baptist church of Covington. For twenty years Mr. Walker was a member of the I.O.O.F. Politically, he is a Republican, and has held most of the township offices at different periods. Milton R. Walker, youngest child of Lewis and Isabel Walker, was born on his present farm in Covington township, June 14,1846, and has spent his entire life upon the homestead, which contains seventy-four acres and is well-improved. May 4,1872, he married Hannah M. Wilcox, a daughter of Benajah Wilcox. She was born August 30,1850, and is the mother of five children, as follows: Cora M., William J., Lewis., Isabel and Hannah M. Mrs. Walker is a member of the Christian church. In politics, he is a Democrat, and has served three years as school director and one year as treasurer of the school board. James Walker, youngest son of Isaac Walker, was born at Langdon, New Hampshire, April 22,1809, and was only four years old when the family settled in Covington township, where he attended school in the pioneer log building of that locality. After attaining manhood he purchased a small farm, and also worked in a sash and blind factory at Covington for a few years. He later took up the carpenter’s trade, and subsequently sold his property in Covington and bought a farm in the eastern part of Covington township, which he afterwards disposed of and moved to Blossburg, where he was employed for about twenty years as foreman of the carpenter department in the shops of the Tioga Railroad Company. In 1884 he retired from active labor, and resided with his son, Delos H., up to his death, July 18,1887. Mr. Walker married Eliza Hazelton, a daughter of Dr. John Hazelton, of Townsend, Vermont, who bore him three children, Viz: Delos H., of Covington township; Roswell A., who died at Belle Plains, Virginia, December 9,1862, while a soldier in Company C, One Hundred and Thirty-second Pennsylvania Volunteers, and Mary A., wife of Alfred T. James, of Phillipsburg, Pennsylvania. Mrs. Walker died at the home of her son, Delos H., January 25,1885. Delos Hazelton Walker, oldest child and only living son of James and Eliza Walker, was born in Covington, Tioga county, November 25,1835. He obtained a good common school education, commenced teaching when nineteen years of age, and taught seven winter terms. When twenty-one years old he rented a farm in Covington township, on which he resided up to 1862, and then went to Morris Run, where he was employed for ten years by the Morris Run Coal Company, first as weigh master, and later as book-keeper. In the autumn of 1873 he moved to Wellsboro, and in December following he was appointed deputy sheriff, by Sheriff Bowen. In the fall of 1876 he was elected Sheriff, on the Republican ticket, with which party he has always affiliated, and served a full term. In the spring of 1880 he removed to a farm in Covington township , three miles southwest of Covington, which he had purchased during his residence in Morris Run. It contained 130 acres of well-improved land, and he also owns 180 acres of timber land in the same township. He has since devoted his principal attention to general farming, and is one of the leading agriculturalists of this section of the county. Mr. Walker was married June 9,1860, to Julia A. Frost, a daughter of Lyman Frost, who came from Tioga county, New York, at an early day and located in Covington township, the locality being now known as the “ Frost Settlement,” where he engaged in the lumber business. Mr. Frost married Hannah Ufford, who bore him eleven children, ten of whom grew to maturity, viz: Asal V., of Wisconsin; Ruel, of Nevada; Nathaniel, who lives in Minnesota; Keziah, wife of M.C. Seely, of Washington; Nancy, wife of Horman Allen, of Missouri; Julia A.,[married Delos Walker and Mary L. ] wife of Arthur Goodspeed, of Mansfield; Jane, wife of S.D. Cudworth, of Missouri, and Lyman, a resident of the same State. Mrs. Frost died in Mirabile, Missouri, April 23,1885, and her husband, in the same place, August 7,1896, at the ripe age of ninety-one years. Mrs. Walker was born June 28,1839, and is the mother of five children, viz: Maud Lillian, and Bertie Roswell, both of whom died in infancy; Houston Frost, principal of the Blossburg schools; Bertha May, wife of Oliver F. Kelly, of Corning, and Lyman James. Mr. And Mrs. Walker are members of the First Baptist church of Covington. He has always taken a prominent part in public affairs, has filled the offices of school director, auditor and township clerk, and is a K. of H.
Samuel Frost, a native of Massachusetts, born April 7,1781, was a successful farmer and lumberman. He married Keziah Edson , and reared a family of eleven children, viz: Lucy, Hiram, Lyman, Julia, Calvin, Ashel, Samuel, Betsy, James, Stillman and Elias, the last three of whom were born in Tioga county, New York. Of this family Lyman, Calvin, Samuel, James and Elias, all ;ocated at or near what is now known as the “ Frost Settlement” and have left numerous descendants in this section of the county. Elias Frost, youngest son of Samuel Frost, was born in Tioga county, New York, February 19,1822. When he was sixteen years old he went to work on his own account, and after arriving at manhood bought a farm in the Frost settlement. Nine years later he sold this property and in the fall of 1856 purchased 132 acres in Richmond township, where he has since resided. In 1847 he married Elizabeth Bryant, daughter of David Bryant, of Richmond township, who bore him six children as follows: Adaline, deceased; Harvey, a resident of Richmond township; Samuel S., of Covington township; Ameda, deceased; Adelos, wife of Burt Mudge, of Covington, and Arthur, a farmer of the same township. Samuel S. Frost, a son of Elias Frost, and a grandson of Samuel Frost; was born in the Frost settlement, Tioga county, July 28,1850, and attended the common schools in boyhood. When nineteen years of age he began working out as a farm hand, which he continued up to his twenty-fourth year, when and his brother Harvey, bought a farm. A year later he sold his interest in this property, and in April, 1894, purchased fifty acres of his present farm. In October, 1883, fifty acres more, and now owns a well improved property of 160 acres. Mr. Frost was married March 30,1873, to Dorcas M. Kiley, a daughter of John Kiley. She was born on December 30,1853, and is the mother of four children, viz: Walter E., Stella M., John S. and Earl J. Mrs. Frost is a member of the Methodist Episcopal church. In politics, a staunch Republican, Mr. Frost has filled the office of school director for the past five years and was treasurer of the school board for three years. He is one of the enterprising farmers of his native township. Ephraim B. Gerould was born in Newtown, Connecticut, January 14,1788, a son of Jabez and Demaris (Bennett) Gerould. His father was born in Wrentham, Massachusetts, November 1,1748, and was a son of Gamaliel and Rebecca ( Lawrence) Gerould, and a grandson of Dr. Jacques Gerould, a silk manufacturer of France, who came to America in 1685 and finally located in Medfield, Massachusetts. Jabez Gerould was a soldier in the Revolution, and subsequently followed blacksmithing in Newtown, Connecticut, whence he removed to Franklin, New York, in 1798. In 1801 he located in East Smithfield, Bradford county, Pennsylvania, where he died on June 12,1802. His wife, Demaris, survived until March 20,1829. Their children were Jerusha, James, Susanna, Ephraim B., George, Ziba, Jabez L. Abel J. and Theodore. Ephraim B. was thirteen years old when the family settled in Bradford county. There he grew to manhood and married Elizabeth Foster, who bore him one son, Theodore Clark. She died on August 11,1824, and soon afterwards Mr. Gerould came to Tioga county and bought a large farm in Covington township. He subsequently married Christiana Putnam, a daughter of Thomas Putnam, who became the mother of three children, viz: Henry M., Otis G. and Maria E. Mr. Gerould was a prominent and successful man, and was actively engaged in merchandising, lumbering and farming. He was also a surveyor, and agent for the Bingham lands in this section of the county. He was an earnest worker in the Baptist church, and in politics, a staunch Democrat. He filled the office of postmaster for a period, and was a brigade inspector in the militia. He died on April 22,1845, and his wife Christiana, October 23,1871. She also was an active and zealous worker in the Baptist church, and it was through her faithfully carrying out the plan of her husband, after his death, that the Baptist church edifice was erected. Otis Gibson Gerould, [SRGP 88457] ex-treasurer of Tioga county, was born in the borough of Covington, Tioga county, December 17,1830, and grew to manhood in his native township. He obtained a good education , and adopted farming as his life vocation. In November, 1861, he enlisted in Company Seventh Pennsylvania Cavalry, and was made commissary sergeant. In 1862 he was promoted to battalion commissary sergeant, and served in that capacity until September 9,1863, when he rejoined his company with the rank of first sergeant, and participated in all of its battles up to October 13,1864, when he was wounded near Rome, Georgia. He was confined in hospital until March, 1865,when he rejoined his company with the rank of first lieutenant, and was honorably discharged at Macon, Georgia, in August, 1865. Returning to his home he resumed farming, which he continued up to 1880. In 1889 he was elected county treasurer, and filled the office three years. He has also been a justice of the peace for ten years, and has filled the office of school director, member of council, high constable, street commissioner and collector of taxes, as well as that of burgess of Covington. Mr. Gerould was married January 13,1855, to Mary, a daughter of John Seamon, of Ithaca, New York, to which union have been born seven children, viz: Putnam B., a glass worker, of Covington; Otis, a book-keeper and farmer, who lives in California; Asah, who died at the age of six years; Effie, a kindergarten teacher in Cleveland, Ohio; Belle, wife of Herbert L. Bloom, of Wellsboro; Christiana, wife of Edgar E. VanCampen, and James N. a glass worker, of Kane, Pennsylvania. Mr. And Mrs. Gerould are members of the First Baptist church, and in Politics, he is a Republican. He has been a member of the I.O.O.F. since 1856, and was district deputy for eight years. He is also connected with the U.V.L. and the G.A.R, in both of which he takes an active interest. John Jaquish was born in New York City, June 17,1754. His father, a native of England, was a sea captain, though it is supposed that he was murdered by Captain Kidd, the notorious pirate. When John was fourteen years old he was bound out to learn the harness-maker’s trade, and at the breaking out of the Revolution he enlisted and served throughout the war. He was afterwards given a pension and three land grants in the state of New York, on one of which he settled, in Delaware county, where he resided up to his death, August 3,1845. He married Catherine Wheaton, who bore him eleven children, viz: John, Margaret, Dorothy, Joseph, Elizabeth, David, James, Mattias, Daniel H., Sarah and Nathan B. Mrs. Jaquish died September 8, 1842, in the eighty-first year of her age. Joseph Jaquish, second son of John Jaquish, was born in Delaware county, New York, November 2,1787, and there grew to manhood. He received a food education, and after teaching school for a few years, he rented land and engaged in farming. In June, 1828, he came to Tioga county, Pennsylvania, and bought 120 acres of forest land, where Charles Jaquish now lives, which he cleared and improved, residing thereon up to his death, August 3,1867. He married Clarissa M. Reynolds, a native of Rhode Island, born December 2,1793, who became the mother of eight children, viz: Welcome, who died in 1884, in his sixty-ninth year; Horace S., a resident of Richmond township, born in 1819, who followed teaching and farming, also served in Company B, One Hundred and First Pennsylvania Volunteers; Charles, a farmer in Covington township; Joseph B.,a resident of Minnesota, who served in Company K, Two Hundred and Seventh Pennsylvania Volunteers; Phoebe M., deceased wife of W.H. Strong, of the same State; Desire A., widow of Henry Beardsley, who lives in Wisconsin, and Elizabeth M., widow of Evan Lewis, of Charleston township. Mrs. Jaquish died on the old homestead February 17,1864. Charles Jaquish, a son of Joseph Jaquish, was born in Delaware county, New York, November 21,1823, and was in his fifth year when the family settled in Covington township, Tioga county. He attended the common schools of that township, and when twenty-one years old bought a farm of seventy acres in Sullivan township, on which he resided up to the spring of 1885. He then sold his Sullivan farm and bought eighty-four acres of the farm which was settled by his father in 1828, where he has since resided. On November 12, 1846, he married Elizabeth G. Walker, a daughter of Lewis Walker. She was born on October 25,1827, and bore him a family of six children, viz: Charles L., who died on December 30,1880, leaving a widow, Eliza (Robinson) Jaquish and one son, Frank C. who lives in Mansfield; George H., an outside foreman in the mines of Clearfield county mines; Ellen J., wife of B. A. Webster, of Sullivan township; Joseph S., also an outside foreman in Clearfield county mines; Francis E., who died March 13, 1873, and Jane A. wife of Lincoln Whitteker of Richmond Township. Mrs. Jaquish died on March 27,1874. Politically, Mr. Jaquish is a Republican, and has filled the offices of school director and justice of the peace. He was a member of the I.O.O.F. for thirty years, but is not now actively connected with the society. Charles Howland was born in Hamden, Delaware county, New York, February 17, 1820, a son of Asa Howland, a native of New Hampshire, and a grandson of Seth Howland. Asa ;earned the shoemaker’s trade in his native place, and later removed to Delaware county, New York, and became a farmer. In 1839 he removed to Springfield township, Bradford county, Pennsylvania, where he followed farming for many years, but finally resumed work at his trade He removed to Elmira, New York, about 1850, and there died July 4,1861. His wife, Lucretia Benjamin, bore him a family of eleven children, ten of whom grew to maturity, as follows: Juliet, deceased wife of Albert Jones, of Elmira, New York; Marietta, who died in Elmira at the age of sixty-eight years; Charles, of Covington; Ransford F., who died in Williamsport, leaving one daughter, Hattie; Angilette, widow of Dr. Julius Rea, of Milford, Delaware; Antoinette, deceased wife of Robert Hill, of Elmira; Gaylord, a resident of Cananadaigua, New York; Benjamin F., a leather merchant of Cedar Rapids, Iowa; Leroy, who died in Kansas, and Janette, widow of George W. Parsons, of Elmira. Mrs. Howland died in Elmira in September 1881. Her husband was a soldier in the War of 1812, serving from New York state. 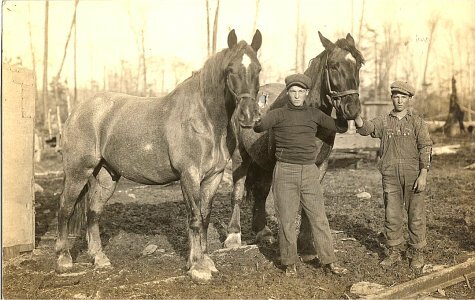 Charles Howland spent his early life on his fathers farm. In 1840 he came to Tioga county and found employment with Boyd & Cleaver, a lumber firm of Covington township. During the next twelve years he also worked for other firms, and made a number of trips down Pine creek, and the Tioga and Susquehanna rivers as a raft steersman, acquiring much skill and proficiency in that line of work. In September , 1840, Mr. Howland helped load the first train that left Blossburg over the Tioga railroad, then just completed. In 1842 he sawed three months on the lumber used in the construction of the Seymour House, Blossburg. In 1858 he bought the Royal Walker farm of eighty -one acres, upon which he has since lived, giving his attention to agriculture. On January 1,1849, he married Eliza Walker, a daughter of Royal Walker. She was born August 11,1824, and became the mother of seven children, as follows: Ella L., widow of S.A. Hoagland, of Marion, Iowa; Edward L., a box maker in the Covington Glass Works, who married Mary Williams, and has three children, Eliza, Pearl and Harry; Emma L., Who died at the age of nine years; William E., a glass worker in Frankton, Indiana, who married Louisa Lutes, and has one child, Maude; Charles H., a glass blower in Frankton, who married Sarah Coe and has one child, Hazel; Ransford and Ransford and Randolph, twins, the latter of whom died at two years of age. Ransford is a packer in the Covington Glass Works, married Anna Marvin, and has three children: David F., Anna and Ransford. Mrs. Howland died October 29,1873. O December 16, 1874, Mr. Howland married Martha J. Johnson , a daughter of Simon Johnson, of Troy, Bradford . She was born November 22, 1836, and is a member of the First Baptist church of Covington. In politics, Mr. Howland is a Democrat, and has filled the offices of burgess, assessor, collector and served in the Covington council. He is also connected with the I.O.O.F., and P. of H. societies, and is recognized as one of the substantial citizens of the borough. John Calvin Bennett was born in Sherman, Connecticut, September 9,1812, and removed with his parents to the Canisteo valley, near Hornellsville, New York, about 1824. About 1836 he purchased a pre-emption right to several hundred acres of land near Clinton, Iowa, upon which he located . Owing to the unsettled condition of the country, on account of hostilities breaking out between the whites and Indians, he disposed of his claim and returned to Pennsylvania, settling in Richmond township, Tioga county. Here he married September 11,1838, to Olive Wilson, a daughter of Summer Wilson, one of the pioneer settlers of that township. To this union were born two children, Albert M. and Frank E. The latter died in 1861. In 1849 Mr. Bennett removed to Covington and engaged in mercantile pursuits, continuing there during the remainder of his life. His death occurred on January 21,1889. His wife survived him about a year, dying March 19,1890. Mr. Bennett was a member of the Presbyterian church for many years, and was connected with the I.O.O.F. from 1849, in which he joined the Covington lodge. His surviving son, Albert M. continued the business started by his father until January 1,1896. In 1892, associating with other business men of Covington, they purchased the Covington Glass Works, of which he became manager. Resigning early in 1893, he removed to Elmira, New York, where he erected and became manager of the Elmira Window Glass Works, owned by the Elmira Glass Company, which position he still holds. Joseph W. Whiting was born in Readsboro, Vermont, January 5,1820. A son of Danforth and Rebecca ( Sherman) Whiting and a grandson of Danforth Whiting, who located in Bradford county, Pennsylvania, about 1827. Joseph W. received a common school education, and when twenty-one years of age, bought a small farm in Columbia township, Bradford county, on which he resided for seventeen years, adding to his original purchase until he owned 215 acres. He sold this farm in the spring of 1848, and bought his present farm in Covington township, Tioga county, from Lyman Frost., which now embraces 325 acres. Here he has lived for the past forty-seven years., engaged in general farming. On October 24,1867, he married Julia A. Kingsbury, a daughter of Absalom and Polly Kingsbury, of Covington township. She was born July 27,1827,and bore him one daughter, Gena, born July 28, 1871, now wife of James A. Kendrick, of Covington township. Mrs. Whiting died December 27, 1887, and he was again married May 24,1888, to Laura N. Ayres, a daughter of Abijah A. and Thursa ( Palmer) Ayres, of Canton, Bradford county . She was born September 22,1847. Mr. Whiting is a member of the First Baptist church of Covington, while his wife is connected with the Methodist Episcopal church. In politics, a Republican, he served five years as justice of the peace, one year as assessor, one as collector, and about thirty years as a school director. Mr. Whiting is one of the prominent, well- to- do farmers of the township, and is highly respected for his many sterling qualities. Stephen F. Richards was born in Milford, Otsego county, New York, October 26,1823, a son of Rectus and Susanna ( French) Richards, natives of Massachusetts. His father was a farmer and cloth manufacturer, and was twice married. His first wife, Susanna French, bore him six children, viz: William, who died in infancy; Mary, deceased wife of the late David Pitts; Stephen F., of Covington township; Emily , wife of Samuel Hitchcock, of Massachusetts; Otis, who was a farmer, merchant and teacher and died at Nelson, Tioga county, and Susanna, who died in childhood. Mrs. Richards died in 1836, and he subsequently married Nancy Thayer of Massachusetts. He died in Hampshire county, Massachusetts, in 1873, aged Eighty-four years. Stephen F. obtained a good common school education and in 1846 came to Tioga county. He purchased a farm in Sullivan township, where he lived up to 1858, when he sold it, also another property that he owned in the Frost settlement which he had bought in 1854, and then purchased eighty acres of his present homestead , since increased to 200 acres. Here he has resided, engaged in general farming, but making a specialty of raising and handling stock, principally horses, having sold one horse , Beucephalus, for $3,400. Mr. Richards has been twice married. His first wife Mary Snow, bore him one child, Mary now the wife of Harris Guilford, of Massachusetts. His second marriage occurred September 29,1860, to Elizabeth C. Johnson, a daughter of Joseph Johnson, of Covington township. She was born in Blossburg April 20,1843, and is the mother of three children, viz: Stephen F., born April 20,1863, and died on April 2,1880; William F., born March 20, 1866, and Edward A., born July 29, 1881. William F. was educated in the common school and at Mansfield State Normal, and is engaged in farming on the homestead. He married Florence DeHaas, a daughter of Alexander DeHaas of Clinton county, September 3,1891, and has two children, Helen V. and Harold J. Both he and wife are members of the Presbyterian church. Mr. And Mrs. Richards are members of the Presbyterian church also of the Patrons of Husbandry, and he is connected with the I.O.O.F. He has served two terms as justice of the peace , and in politics , is an independent voter. John Kiley retired farmer, was born in Georgia, Franklin county, Vermont, May 27, 1821, a son of Michael and Betsey ( Hurlbut) Kiley, the former a native of Ireland, and the latter of Vermont. His father came to the United States at the age of fifteen and learned the tailor’s trade, and followed that business in connection with farming. He reared six children, viz: John, James , Ebenezer, Henry, Mary and Lydia. John received a limited education , and worked on the homestead farm in Vermont until twenty-one years of age. He then removed to New York state, where he worked in a saw- mill six years. In 1849 he came to Tioga county , Pennsylvania and found employment in the saw-mills on Mill creek, in Rutland township. Three years later he rented the James R. Wilson farm in Richmond township, which he cultivated up to October, 1862. He then enlisted in Company B, One Hundred and First Pennsylvania Volunteers, and participated in the battles of Williamsburg and Fair Oaks. He was wounded in the latter engagement, which incapacitated him for further services, and he was discharged June 20,1863. Returning to his home in Richmond township , he lived there until 1865, when he purchased a farm of 257 acres in Richmond township and a short time later bought his present homestead of 165 acres in Covington township. He has been unable to do any manual labor since the war. Mr. Kiley was married September 18,1848, to Dorothy Codney, who bore him six children viz: Betsey, wife of Harvey Frost, of Richmond : Dorcas, wife of Samuel Frost, of Covington; Samuel H., a resident of the latter township; John , a physician of Morris Run; Lydia , wife of Prof. C. B. Clark, of Antrim, and Frank, a physician of Gordon, Schuylkill county. Mrs. Kiley died in February, 1887, aged forty-seven years. Mr. Kiley resides with his son , Samuel H. He is a staunch Republican, and a member of the G.A.R. and the P. of H.
Samuel H. Kiley, eldest son of John Kiley, was born in Richmond township, Tioga county, July 26, 1857, and attended the common schools in boyhood. In 1882 he purchased his present homestead in Covington township , and has since devoted his attention to farming. On December 25,1879, he married Adel Clark, a daughter of John Clark, of Sullivan township, and has four children, viz: Love, John, William and Ross. Mrs. Kiley is a member of the Methodist Episcopal church. Politically, Mr. Kiley is a Republican and has filled the office of supervisor and school director. He is also a member of the I.O.O.F. and P. of H. societies in both of which he takes an active interest. Nicholas Watkins was born in Connecticut, July 4,1810, and was the youngest son of Benoni Watkins, a native of the same State, who settled on a farm of 200 acres where Austinville, Bradford county, now stands, in 1816. Benoni previously married Hannah Peet, and they reared a family of seven children viz: Daniel, Delights, Betsey, Sally, Abel, Granson and Nicholas. The subject of this sketch was about six years old when his parents settled in Bradford county. He worked at home until 1830, when he purchased a farm in Columbia township, Bradford county, on which he lived six years. In 1836 he bought a farm in Sullivan township, Tioga township , which he cultivated until old age, and then retired to Mainesburg , where he died in May, 1893. He married Sarah Rose, to which union were born six children, as follows: John R, of Covington township: Benoni, a wagon maker in Ft. Scott, Kansas; Lodemia, who died in infancy; Hannah , wife of Jesse Austin, of Mainesburg; Charlotte, wife of Omer Doud, of the same place; and Philetta, wife of B.F. Connelly, also a resident of Mainesburg. Mrs. Watkins resides in Mainesburg with her daughter, Mrs. Doud, at the ripe age of eighty- four years. John R. Watkins, eldest child of Nicholas Watkins, and grandson of Benoni Watkins, was born on the Tioga and Bradford line, two and a half miles west of Austinville.He obtained a common school education and worked on the homestead until twenty-five years of age, when he began in life for himself, as a farmer. In the fall of 1869, he purchased his present farm of ninety acres, in Covington township, on which he lived for ten years. He then went to Bradford, McKean county, and carried on a fruit and vegetable store for two years, at the end of which period he returned to his farm in Covington. In 1889 he embarked in the lumber business, which he continued until the spring of 1896, when he resumed farming. On February 20, 1857, Mr. Watkins married Sophia Welsh, a daughter of Leonard Welsh, of Sullivan township, and has two children, viz: Rosa B., wife of David Ames, of Covington Township, and Jay R., who was born on July 21,1867. The family are members of the Church of Christ, and in politics, adherents of the Republican party. Abel Watkins was born in Connecticut, in 1806, a son of Benoni Watkins, a native of the same State, who settled on a farm of 200 acres where Austinville, Bradford county now stands, in 1816. Benoni previously married Hannah Peet, and reared a family of seven children, viz: Daniel, Delighta, Betsey, Sally, Abel, Granson and Nicholas. Abel was ten years old when the family located in Bradford county, and grew to manhood on the homestead farm, and attended the pioneer school of the district. He later purchased a farm in Sullivan township, Tioga county , where he followed farming and stock-droving up to 1872, when he retired to Sylvania, Bradford county, and died in 1880. He married Mary VanGorder, who bore him seven children, as follows: Hannah, deceased wife of the late Dr. Burchard, of Chicago; Andrew J., Deceased; Emma, wife of E.R. Backer, of Elmira; George, a resident of California; Jerusha, widow of Dayton Hollenback, of Sylvania; Seely E., a farmer of Richmond township, and Frank, a lumberman of Covington township. Mrs. Watkins died on June 23,1894. Andrew J. Watkins, eldest son of Abel Watkins, was born in Sullivan township, Tioga county, October 13,1830, and was reared and educated in his native place. On attaining his majority he purchased a farm in Rutland township, whence he removed to Richmond , but returned to Rutland again. In 1870 he located in Covington township, purchasing a farm of 350 acres, one mile above Covington to which he later assed 180 acres more. He and his brother Seely also bought the old homestead in Sullivan township. In 1889 he moved to a small farm in Covington borough, where he died in February, 1890. He married Clarinda Hurd, who bore him four children, as follows: Rush J., a steamboat captain in the state of Washington; Eugene O., of Covington township; Olive A., of the same township, and Frederick B. deceased. Mrs. Watkins resides in Covington. Mr. Watkins served in the Union army suring the late Rebellion. He was an active Republican, and filled the offices of assessor and school director. Eugene O. Watkins was born in Richmond township, Tioga county, July 9,1860, a son of Andrew J. Watkins and grandson of Abel Watkins. He attended the common schools of the township and borough of Covington, and has always lived on the old homestead farm. On June 17,1886, he married Mary A. Harding, a daughter of Simeon and Lydia ( Goodnow) Harding, early settlers of Covington, and has two children, Floy L. and Maude C. Mrs. \Watkins is a member of the First Baptist church of Covington. In politics, Mr. Watkins is a Republican, and is also connected with the I.O.O.F. and the P. of H. societies. Rev. George W. Scudder was born at Gorham, Ontario county, New York, August 25,1818, a son of Ezra Scudder. He received a good education and in early manhood began preaching for the Free Will Baptist church, but when the slavery question began to be agitated , he became a Wesleyan Methodist, and for many years preached for that church in the counties of Steuben, Allegany, Schuyler and Tompkins, New York and in Sullivan, Bradford, Tioga and Potter counties , Pennsylvania. He first came to Tioga county in the spring of 1863, and in 1865 purchased a farm in Charleston township, on which his son resided up to 1882. He then sold it and bought one in the northeast corner of Covington township, where he resided until a year and a half before his death, which occurred October 26,1894, when he was stricken with paralysis and removed to the home of his son, Franklin B. Mr. Scudder was married to Emmeline Parsons, a daughter of Thadeus Parsons, of Clifton Springs, New York, October 21,1841. She was born October 20,1820, and is the mother of two children, viz: Ezra F., born July 28,1842, and died June 21,1859, and Franklin B. who lives on the old homestead. Mrs. Scudder lives with her son in Covington township. Martin Stratton was born near Towanda, Bradford county , Pennsylvania, December 22,1807. His parents, Cephas and Hannah (Adams) Stratton, natives of Simsbury, Connecticut, settled in Bradford county in 1791. In 1813 they came to Tioga county, and located near Canoe Camp. They resided in Richmond township and in Mansfield until October 12,1818, when the family left for /Cincinnati, Ohio, settling four miles from that city, on Mill creek, where the parents passed the remainder of their lives. In 1821, the subject of this sketch went to Cincinnati to learn the carpenter’s trade. After serving three years as an apprentice and one year as a journeyman, he went to New Orleans, where he remained but a short time. Returning to Cincinnati, he was induced by promises of government work, to go to Fort Independence, Missouri. Being disappointed in this, he returned to Cincinnati, and in March, 1831, came back to Mansfield. After a three years’ stay in Tioga county, he again returned to Cincinnati, and a year later removed to La Salle, Illinois. In 1840 he returned to Mansfield, and in December, 1841, located at Blossburg. For thirteen years he had charge of the repairs of coal chutes, etc., in Blossburg for William Mallory & Company, and from 1861 to 1876 was in the employ of the Fall Brook Coal Company, at Fall Brook, as master mechanic. For a number of years he had been living retired in Blossburg, his residence, built in 1841-42, being one of the oldest houses in the place. In politics, he is a Republican, and has served a justice of the peace and school director. In religion, he is a member of the Baptist church. Mr. Stratton was married October 18,1832, to Eliza Holden, a daughter of Daniel and Lydia Holden, pioneer settlers of Mansfield. Mrs. Stratton was born in Schoharie county, New York, in 1811, and they celebrated the sixty-fourth anniversary of their marriage October 18, 1896. Three children have been born to them viz: Daniel H., Myron S., a railroad engineer, killed in an accident at Gray’s run, Tioga county, August 25,1892, and Lucy, wife of Rev. Marcellus Karcher, rector of Christ Protestant Episcopal church of Blossburg. Lydia, an adopted daughter is the wife of A.F. Gaylord of the same borough. Daniel H. Stratton, eldest son of Martin Stratton, was born in Covington, Tioga county, January 1,1834. He learned the carpenter’s trade with his father, and from 1853 to 1855 he was in the employ of William Mallory & Company of Blossburg. He then engaged in the grocery business in that place, continuing in the same three years. In the latter part of 1858 he went to Fall Brook, as foreman in charge of constructing and repairing chutes, etc., for the Fall Brook Coal Company. In 1864 he took charge of the railroad shop in Blossburg, a position he still holds. Mr. Stratton was married June 23,1854, to Mary C. Scott, a daughter of Robert and Eliza Jane Scott, to which union have been born ten children, viz: Alice, deceased; Frank H., Mary, deceased wife of E.S. Guernsey, of Salamanca, New York; Fred and Nina both deceased; Lucy H., Jennie, Daniel R., a graduate of the Medical Department of the University of New York; Kate , wife of E.J. Bosworth, of Gaines, Tioga county, and Raymond. In politics, Mr. Stratton is a Democrat. He served in the first council of Blossburg, and has filled the office of justice of the peace, school director, auditor and township clerk. He is a member of the Masonic order and of the K. of H.
Frank H. Stratton, eldest son of Daniel H. Stratton, was born in Blossburg, Tioga county, April 14,1857, and was educated in the public schools and the State Normal School at Mansfield. He clerked for some years in the railroad shop office, and for seven years had charge of the weigh office in Blossburg of the Morris Run and Fall Brook Coal Companies. From 1885 to 1889 he was United States gauger of the Twelfth district of Pennsylvania, after which he again took charge of the weigh office of the companies named. On March 29,1894, he was appointed by President Cleveland postmaster of Blossburg, which office he still holds. He is also superintendent of the Blossburg Water Company. Mr. Stratton was married in June,1889, to Maria Bowen, a daughter of the late Stephen Bowen, sheriff of Tioga county from 1873 to 1876. They are the parents of three children, viz: Augustus D., Agnes and Nina. Mr. Stratton is an ardent Democrat. He is a past master of Bloss Lodge, No. 350, F. &A.M., and is also connected with Wellsboro Chapter, and Tyagaghton Commandery of Wellsboro. Patrick Bannon was born in Thurlas, County Tipperary, Ireland, in April, 1814. In 1827 he went to Wales, and worked in the iron furnaces there until 1836, when he immigrated to the United States and Located in Troy, New York, but soon afterwards removed to Pottsville, Pennsylvania, where he worked as a moulder in a foundry. In 1840 he came to Blossburg, Tioga county, and during the remaining years of his life, until he retired , he worked in the mines at Blossburg and Morris Run. A few years before his death, which occurred September 17,1894, at the age of seventy-nine, he was interested in developing a tract of coal land near Hoytville. His agreement with the owner was that if he struck the Blossburg vein he was to have one-half the land. He died before securing the deed, and the matter is now in the courts. Mr. Bannon came to Blossburg when there were but a few families in that place. The railroad had just been completed and the work of developing the coal deposits begun. He soon became known as a man of enterprise and public spirit. It was through his efforts that the first Catholic church in the county was established in Blossburg. He secured the gift of the site from Hon. Horatio Seymour, and collected the money for the erection of the church building, which was afterwards dedicated as St. Andrew’s Catholic church. He was a member of the C.T.A., also of the K. of L. In politics, he was a stanch Republican, and served as a member of the council, supervisor and school director for a number of years. He was tireless in his efforts to secure the establishment of a public school in the village, in which project he was finally successful . He lived an earnest , useful life, and enjoyed the respect and esteem of the leading people of the county. Mr. Bannon was married April 14,1839, in Pottsville, Pennsylvania, to Joana Lonegan, a daughter of William Lonergan, a merchant of Thurlas, Ireland. Mrs. Bannon, who, notwithstanding her advanced age, preserves an active mind and a clear memory, was born April 7,1816, and came to Canada with her parents as a child. Her father located on a farm near Montreal where the family resided until 1834,when they removed to Pottsville, Pennsylvania, where Mrs. Bannon met and married her late husband. Four of her brothers were in the Union army, viz: William, a deceased manufacturer of St. Lewis, Missouri; James, a farmer of the same State; Patrick, who also resides in Missouri, and John, a resident of Fort Wayne, Indiana. Another brother , Michael, went to St. Lewis at an early day, and died there of yellow fever in 1837. Mrs. Bannon is the mother of seven children, viz: Mary, wife of William Larkin, of Bradford McKean county. William , a resident of the same place, who married Lida English; Anthony, a resident of Bradford , ex-state senator of this district, to which office he was elected in 1892, having previously served as a member of the council of Kendall Creek, coroner of McKean county, sheriff of the county, chairman of the Republican county committee, a delegate to the state convention, congressional conferee, reading clerk of the State Senate in 1889 and journal clerk of the same body in 1891; Joana, a resident of Bradford ; Jane, who resides with her mother ; Lizzie, wife of Christopher O’Connor, of Jefferson county, and Alice, who lives at home. Mrs. Bannon is a woman of education and refinement and enjoys the regard and confidence of a large circle of friends. She is one of the oldest residents of Blossburg. Henry Kilbourn, physician and surgeon, was born in Shrewsbury, Vermont, March 23,1802. He studied medicine in his native State, at Castleton, and received his diploma in 1828. In December of that year he married Miss Fannie Briggs, to which union were born the following children: Henrietta, a resident of Portland ,Oregon; Antionette, widow of S.B. Brown; Henry, deceased; Ferdinand, a resident of Sumnerville, Kansas; Catherine, a resident of Wellsburg, New York, and James V., who resided in Silverton, Colorado. The mother died, and he remarried for his second wife, Lucy M. Dyke, who bore him two children: Orpha, deceased, and Kenyon. His seconds wife died May 13,1873, aged thirty-six years. In 1840 Dr. Kilbourn came to Tioga county and settled in Covington, from which time until his death November 26,1886, he continued the practice of his profession . During this period he lived alternately at Covington and Blossburg , the last twenty years of his life being spent in the latter town. He traveled throughout the eastern part of Tioga county, where he is held in loving remembrance. He also practiced at Fall Brook and for many years was the leading physician in that portion of the Tioga valley. Dr. Kilbourn was descended from one of the oldest families of New England, and brought with him to Tioga county a musket used by one of his ancestors in a desperate fight with Indians at Walpole, Connecticut, in 1755. It measured from muzzle to shoulder- guard five feet eleven inches, and carried an ounce ball. Dr. Kilbourn was a great story teller, and somewhat eccentric, but was respected by all who knew him. Kenyon Kilbourn, only son of Dr. Henry and Lucy M. (Dyke) Kilbourn, was born in Covington, Tioga county, June 1, 1862, and received a common school education. After leaving school he worked for a time on the coal chute at Arnot, and later as a brakeman on the Tioga railroad. In the spring of 1885 he was employed in the freight office at Blossburg, remaining until March, 1888, when he secured his present position as weigh master for the Erie Railroad Company, his duties being to weigh the coal mined at Arnot and Landrus. The position is one of much responsibility, but during the past eight years he has proven himself faithful and efficient Mr. Kilbourn was married July 19, 1885 to Elnora N. Fulkerson, a daughter of Enoch and Mary Ann Fulkerson of Blossburg. And has four children: Edna K., John M., Cora B. and an infant son. In politics, he is a Republican, and is recognized as an enterprising citizen. Luther Johnson was born in Vermont, in 1790. In 1812 his parents came to Tioga county, and settled on a farm near Wellsboro, in Charlestown township. Here he grew to manhood and married Zilpha Shumway, born June 11,1796, a daughter of Peter Shumway, to which union eight children were born, as follows: Silas, Eli and Jacob, deceased; Sarah, wife of Elmer Bacon, of Nebraska ; Moses and Luther W., deceased; Lydia, wife of Curtis Culver, of Middlebury, Tioga county and Alonzo, a farmer residing in Wellsboro. Mr. Johnson died October 17,1849; his widow survived him until February 17,1877, dying at the age of eighty-one years. Dr. Luther W. Johnson son of Luther and Zilpha ( Shumway) Johnson, was born in Wellsboro, May 4,1833. His early education was acquired in the Wellsboro Academy, from which he graduated in 1852. He next took a course in the classical and medical department of the State University at Ann Arbor, Michigan, graduating in 1856. In 1857 he began the practice of medicine in Liberty, Tioga county. He continued the practice of his profession at that place until 1883, when he removed to Blossburg, where he practiced without interruption until his death, June 29,1896. He was one of the oldest physicians in years of practice in Tioga, county. He was a formerly a member and one of the organizers of the Tioga County Medical Society. Dr. Johnson was married June 7,1858, at Wellsboro, to Mary C. Mathers, a daughter of John Mathers. To this union were born the following children: Edward W.; Nettie V., wife of Dr. U.G. Beck, of Elmira, New York; Helen E., wife of Edward Saks, of Milton, Pennsylvania, and Gracie. Dr. Johnson was a life-long Democrat and a member of the Methodist Episcopal church. In addition to his extensive practice he also conducted a drug store. He was recognized as one of the progressive and enterprising citizens of Blossburg. John Cook was born at Stockton-on-Tees, County of Durham, England, January 24,1831, and is a son of Isaac and Ellen (Roe) Cook. They were the parents of eleven children, of whom six grew to manhood and womanhood, viz: Elizabeth, deceased wife of Phineas Harrington; Isaac, deceased; Jane, wife of Joseph Baker, deceased; John the subject of this sketch; Hannah, wife of George Watson, and William, who died at Morris, Tioga county, in September,1892. John came to Pennsylvania in 1847, and spent a few months in Reading, locating at Blossburg, Tioga county, April5,1848. He had learned the bricklayer’s and plasterer’s trades in England, and followed the same after coming to Pennsylvania. He also worked in the coal mines at Arnot, Barkley, Fall Brook and Morris Run for about six years; but his trade has been his life vocation, and he has worked on a majority of the buildings erected in Blossburg since 1848. Mr. Cook was married May 24, 1851, to Mary Harris, a daughter of Rev. Henry Harris, a native of Habersuchan, Monmouthshire, Wales, who came to Pennsylvania in 1837, resided for a time in Minersville, and then located in Blossburg, Tioga county. He afterwards went to Providence, Rhode Island, to work and fatally injured by a boiler explosion, living but a few days. Mr. And Mrs. Cook are the parents of eight children, viz: William H., Isaac Herbert, deceased ; Phoebe Ellen, widow of David Botchford; Hannah Mary, wife of James S. Kirkwood; Isaac Herbert (2), George Edward, Alice Jane, deceased, and Elizabeth Jane, wife of Henry H. Reese. In politics, Mr. Cook is a Prohibitionist, has served as treasurer of the borough for several years, also as judge and inspector of elections, and is now serving a second term as justice of the peace. For a number of years he has been a local preacher of the Methodist Episcopal church, and for ten years or more superintendent of the Sunday-school. He is one of the oldest citizens of Blossburg, and has lived a life of quiet industry. A man of high moral character and deep religious convictions, he has exemplified his principles and his beliefs in his daily life, winning thereby the respect and esteem of his fellowmen. John Lawrence Sexton was born in Veteran township, Chemung county, New York, July 13,1830, a son of John Lawrence and Hannah (Kenyon) Sexton. He is a descendant of one of the oldest Scotch-Irish families of the United States , his paternal ancestor having located in the valley of the Connecticut in 1637. His grandfather, Elijah Sexton, was a soldier in the French and Indian War and an officer on the Continental army. When John L. was quite young his parents removed to Big Flats township, Chemung county, New York, where his father purchased 700 acres of white pine timber land, erected saw-mills and engaged in lumbering. Young Sexton was reared on the farm, was principally educated at the fireside and in the common schools, but received special training in elocution, logic and rhetoric. Before he was twenty years of age he had read Blackstone, Kent, Storey and Marshall and the standard English poets, and had mastered “ Town’s Analysis of the English Language.” On May 28,1851, he married Grace Adelaide Patterson, a grand-daughter of Robert Patterson, a Revolutionary soldier and a daughter of Benjamin and Jane (Jones) Patterson of Lindley, Steuben, county, New York. For ten years thereafter he pursued farming and lumbering, in the meantime serving six years as superintendent of township schools of Big Flats, and several years as deputy United States marshal. Meeting with reverses, through the failure of the Bank of Corning, he came to Fall Brook, Tioga county, and was employed by Hon. John Magee, first as a laborer in the forest and subsequently as store clerk, weigh master and shipper of coal. He also filled the offices of assessor, school director, justice of the peace, burgess and principal of the public schools, receiving provisional, professional and a permanent certificate from the school department of Pennsylvania as a teacher. In 1875 Mr. Sexton was selected by Gen. William McCandless as clerk to assist in organizing the bureau of labor and industrial statistics of Pennsylvania, at Harrisburg, and almost the entire labor of formulating, classifying and arranging the details of the bureau devolved upon him. At the close of his four years’ term he returned to Tioga county, located at Blossburg, and established the Blossburg Industrial Register, which he continued to publish for two years. The next five years he devoted to literary pursuits, during which time he wrote the histories of Tioga and Bradford counties, Pennsylvania, and Steuben, Chemung, Tioga and Schuyler counties, New York; “ The White Slaves of Monopolies,” “ Uncle Jonas Lawrence’s Letters,” and numerous articles for the Sunday Telegram of Elmira, the New York Sun, the Harrisburg Patriot and other newspapers. In December,1885, his son, Benjamin P. Sexton, established the Blossburg Advertiser, of which the subject of this sketch is business manager and a general contributor to its columns. Under Mr. Sexton’s management the Advertiser has attained a large circulation, and it wields a strong influence throughout the Blossburg coal region. Mr. Sexton is a fearless and able writer , and has delivered many public addresses, among them the Centennial address in the House of Representatives, at Harrisburg, July 4,1876, on the progress and development of Pennsylvania for 100years; two Centennial addresses at Painted Post, New York; an address at the unveiling of the monument erected to the memory William Mapes, a Revolutionary soldier , by the counties of Steuben and Chemung, at Big Flats, in August, 1873; the Centennial address on the establishment of the Grand Lodge of Free Masons, and the Centennial address at the Polish celebration in Blossburg, May 3,1891. Mr. Sexton, is a member of the Dauphin County Historical Society of Harrisburg; an honorary member of the Historical Society of Pennsylvania, at Philadelphia, and is well versed in the history of the State, and well acquainted with its geological formations and its varied mining, manufacturing, agricultural, railroad and industrial interest generally. Mr. Sexton’s family consists of his wife, Grace Adelaide, three sons and four daughters, viz: Samuel M., Benjamin Patterson, John Lawrence, Grace Adelaide, Mary B., wife of Levi Plummer, of Findlay, Ohio; Jane P. and Susie T.
Jacob B. Merrick was born in Wellsboro, Tioga county, Pennsylvania, July 4,1825, a son of Isaac Merrick, and grandson of Israel Merrick, Sr., and obtained a common school education. Upon arriving at manhood he adopted dentistry as his profession, and resided and practiced at different times in Charleston township, Tioga county; Troy, Bradford county; Blossburg and Mansfield, Tioga county, and in Elmira, New York. He removed from the latter place to Mansfield in 1875, and made it the place of his residence until his death, March 1,1878. Dr. Merrick married Lucy A . Burns, a native of Oppingham, Fulton county, New York, to which union were born three children, viz: A.R., a dentist of Millerton, Tioga county; D.O., a dentist of Blossburg, and Walter T., attorney-at-law of the same borough. On December 5,1883, Mrs. Merrick married for her second husband , Rev. Hiram Short, a minister of the Methodist Episcopal church. They reside in Blossburg. Michael Kelly was born in County Kerry, Ireland, in 1832. He came to the United States in 1853 and located in Gibson, Steuben county, New York, at which place he resided for three years. In 1856 he removed to Gang Mills, in the same county, where he remained two years, and then located in Corning. Here he embarked in the grocery business, which he carried on in that city up to 1866. In June of that year he came to Blossburg, Tioga county, Pennsylvania and bought the building then owned by Daniel Williams, formerly occupied by the store of the Arbon Coal Company, in which he opened a grocery. He continued in business until 1870, when owing to failing health his wife took charge of the store, which she still carries under the name of Mrs. M. Kelly. It is now the oldest business house in the borough. Mr. Kelly was married August 10,1856, to Bridget Healy, a native of County Kerry, Ireland, to which union were born ten children, as follows: John W., Mary A., Widow of James Kirwan, of Blossburg; Johanna E., Michael F., who married Mary Downs, daughter of William and Mary ( Diggins) Downs, of Washington, D.C., and has two children, William D. and Walter L.; Bridget and Kate, twins; Thomas F. and Peter D., both deceased and two that died in infancy. Mr. Kelly died December 19,1888.In politics he was a Democrat, and in Religion, a member of St. Andrew’s Roman Catholic church of Blossburg, to which his widow and children belong. John W. has served one term in the borough council. He is an adherent of the Republican party, a member of St. Andrew’s Catholic Total Abstinence Society and is regarded as one of the public spirited and progressive citizens of the borough. David R. Evans, son of Richard A. and Mary Evans, was born in Capcoch, South Wales, February 28,1859. His parents immigrated to Pennsylvania, and located in Morris Run, Tioga county, in December ,1870, where his father mined coal until 1874, when he moved to Round Top, where he still resides. The subject of this sketch is the fourth of six children, named as follows: Mary Ann, wife of Daniel Griffiths, of Antrim; Evan R., of Blossburg; John E., of Antrim; David R. of Blossburg; Catherine , wife of Robert Carpenter, of Antrim and Elizabeth Jane wife of Arthur Bowen, of Round Top. At the age of eight years David R. entered a tea store in Wales , remaining there until the family came to the United States. He worked five years in the mines at Morris Run, and in 1876 began clerking in the store of the Fall Brook Coal Company, at Antrim. In 1879 he went to Cleveland, Ohio, was employed for a year as a salesman, and later worked two years in a rolling mill. In 1882he returned to Antrim, re-entered the service of the Fall Brook Coal Company, at Antrim, was employed three months exploring for coal, and was then given the position of boss mule driver in the mines. This he filled for several years and then resumed mining. He next was employed as a traveling salesman for the Grand Union Tea Company. In 1889, in connection with J.J. Mills, he bought out the tea, crockery and glassware firm of Hyde & Cowley, of Blossburg. The business was carried on under the firm name of Evans & Mills until 1890, when it was consolidated with that of Daniel & Newport. In October, 1894, Mr. Evans bought out Mr. Daniels’ interest and has since conducted the business in his own name. October 16, 1879, he married Jane Davis, a daughter of John and Ann Davis, of Cherry Flats, Tioga county, to which union have been born six children, viz: Gwennie, Mary, deceased; Annie, Jane Victoria, deceased; Ethel, deceased; and Rena. In politics, Mr. Evans is a Republican, and in religion, a member of the Welch Congregational church. He is also connected with Blossburg Lodge, No. 167, K. of H.
Matthew C. Blair, merchant tailor, was born in Cumbernauld, Dumbartonshire, Scotland, June 2,1841, and is one of nine children born to James and Mary (Crawford) Blair. The other members of the family are as follows: Eliza, wife of John Russell, a resident of Scotland ; Marian , wife of Alexander Allen, a resident of the same land; James, who resides in Anita, Pennsylvania; William and John, both residents of Scotland; Mary, wife of a Mr. Murray, of Scotland; Janet, wife of James Wiley, of Liberty township, Tioga county, and Jennie, who lives in Scotland. Mr. Blair’s father came to Arnot, Tioga county, in 1873, worked in the coal mines for a few years, and then returned to Scotland, where he died in 1878. The subject of this sketch received a common school education and served an apprenticeship to the tailor’s trade in Scotland. In June, 1869, he immigrated to Pennsylvania, and located in Arnot, Tioga county. He worked in the mines for thirteen years and later at his trade in Arnot for eight years. In 1890 he came to Blossburg and opened a merchant tailor’s establishment over Roberts’ store. In the spring of 1891 he moved further south on the same street, renting for a year and then purchasing the building. Here he remained until the fall of 1895, when he removed to the building occupied by H.H. Roberts. He carried on merchant tailoring exclusively until 1894, when he added ready-made clothing , hats, caps and furnishing goods. Mr. Blair was married December 31,1861, to Susan Arthur, a daughter of John and Susan (Carrick) Arthur, of Cumbernauld, Scotland. Fourteen children have been born to this union, all of whom are living, viz: James, Kate, wife of John Hutchinson, of Houtzdale; Mary, wife of N.R. Mitchell, of Blossburg; Susan , Eliza, Elizabeth, Marion, John, Agnes, Janet, Jennie, Ada and Emma, twins, and Matthew. In politics, Mr. Blair is independent, and in religion, a member of the Church of Christ at Arnot. By unremitting industry and prudence, Mr. Blair haw not only reared and educated his large family, but has built up a profitable and growing business. He is a progressive and enterprising citizen, and has achieved a well-earned reputation for honesty, industry and integrity. Andrew Anderson, merchant tailor, was born in Dolsland, Sweden, January 25,1859, and is a son of Andrew and Cagsa Anderson. He learned the tailoring trade in his youth, and in June, 1881, immigrated to Pennsylvania, remaining a short time in Antrim, Tioga county. He then came to Blossburg and worked for L. Meyers until 1886, when he stared in business for himself in the Odd Fellows’ Hall block. In 1887 he removed to his present location. He has two brothers in this country, Eric, a coal miner at Antrim, and Frank, employed in the tailor shop. His father died in 1878, aged fifty-three years. His mother is still living in Sweden. Mr. Anderson was married in October, 1882, to Annie Carlson, a native of Sweden, to which union two children were born, viz: Kate and Gustav. Mrs. Anderson died December 25,1884. On August 15, 1887, he married Mary N. Hyland, a daughter of Joseph Hyland, of Blossburg, and has three children by this marriage, as follows: Ruth, Arthur and DeSeales. In Politics, Mr. Anderson is a Republican, and in religion, a member of the Lutheran church. He is also connected with Blossburg Lodge, No. 167, K. of H. He is popular both as a business man and citizen, and during the years he has been in business for himself as merchant tailor, has built up a profitable trade. William R. Logan was born February 9,1849, and in 1857 came with his parents, Robert and Barbara ( Shaw) Logan, to Morris Run, Tioga county, Pennsylvania. His father was a coal miner and worked in the mines at Morris Run, Fall Brook and Arnot, until 1875, when he removed to Jackson township, where he followed farming until his death, September 15,1884, at the age of sixty-nine years. His widow died March 23, 1895, aged seventy-three years. William R. was one of fourteen children, viz: James, who enlisted in Company G, One Hundred and Forty-ninth Pennsylvania Volunteers, and was killed at Gettysburg; Alexander, a chute foreman at Arnot; Robert, manager of Bell & Lewis’ stores, Dubois, Pennsylvania; John S., an engineer on the Northern Central railroad, who resides in Elmira; Sarah, deceased wife of James Stevenson, of Cherry Flats, Tioga county; William R., of Blossburg; Margaret R., wife of John E. Brown of Covington; Jacob, who died in October, 1881; Charles S., a physician of Arnot; Barbara, deceased wife of E.J. Payne of Jackson Summit, Tioga county; Jennie R., a resident of Blossburg; Agnes N., a school teacher of Arnot; David Y., a farmer at Jackson Summit and Lizzie W., who died November 14,1895. From 1860 to 1871, Mr. Logan worked in the mines , but in the latter year he entered the store of the Blossburg Coal Company as a clerk, and continued in the employ of their successors, W.W. Bradbury, and the W.W. Bradbury Company, until January,1897, when he located in Blossburg and there opened a grocery store, which he has since carried on. His long experience in Arnot has given him a thorough knowledge of the business, which will prove valuable to him in his new field of effort. On October 24,1872, he married Elizabeth Prethero, a daughter of Charles and Ann Prethero, of Morris Run. To this union have been born six children, viz: Robert E., a bookkeeper in the office of the Blossburg Coal Company, at Arnot; M. Gertrude, William R. deceased; Charles P., deceased; James /r., and Laura M., deceased. In politics, Mr. Logan is a Republican. He served as justice of the peace from 1889 to 1894, and has filled various township offices, In religion he is a member of the Presbyterian church, and is also connected with the K. of P., of Arnot. Israel Biddle was born in Canton, Bradford county, Pennsylvania, July 12,1838,and is the third in a family of eight children, born to Joseph and Elizabeth (Headley ) Biddle. His brothers and sisters are named as follows: Martha, deceased ; Wallace, a resident of Blossburg; Euphema , wife of Alfred J. Conklin; Fidelo and Almerian, residents of Canton; Hettie, deceased and Silas, also a resident of Canton; The parents were natives of Montour county, Pennsylvania, and removed to Bradford county early in the thirties, where they passed the remainder of their lives. Israel was reared on a farm and obtained a common school education. He learned the carpenter’s trade, at which he worked until the breaking out of the war. In April, 1861, in response to President Lincoln’s first call, he volunteered, but the quota being full his company was not excepted. In September, 1861, he enlisted in Company D, One Hundred and Sixth Pennsylvania Volunteers, was mustered in as first corporal, and participated in the engagements of Ball’s Bluff, Big Bethel, Strausburg, Siege of Yorktown, New Kent Court House, Fair Oaks, Sevens’ fight before Richmond, and Malvern Hill. While building an observatory or lookout, at Yorktown, he had three ribs broken by falling timbers dislodged by shells from the rebel batteries. While engaged on the skirmish line at Fair Oaks, May 31,1862, his blanket, which was rolled up on his shoulders, was riddled with bullets, and a ball was imbedded in an ambrotype in his pocket, a likeness of the woman who became his wife .He was honorably discharged November 10,1862, by reason of sickness arising from his injured side. In June, 1863, he responded to a call for Emergency Men, and enlisted in Company C, Thirtieth Pennsylvania Militia. He was made orderly sergeant of his company, and on June 25,1863, he was promoted to second lieutenant. He was discharged with his command, July 26, following. His brother , Wallace, served in Company C, One Hundred and Thirty-second Pennsylvania Volunteers, and was severely wounded at Antietam, while his brother Fidelo was a member of Company D, One Hundred and Sixth Pennsylvania Volunteers and his brother Almerian, of Company C, Thirtieth Pennsylvania Militia. The two latter re-enlisted in Company D, Fiftieth New York Engineers. Mr. Biddle was married September 3,1863, to Adelia Denmark, a daughter of Jesse D. and Emeline Denmark of Ward township, Tioga county. Seven children have been born to this union, viz: Elmer E., a resident of Kane, McKean county; Ina E., wife of Isaac H. Cook, of Blossburg; Bert J., Jesse D., Frank I., Elizabeth and Anna. After leaving the army Mr. Biddle returned to Canton and resumed work at his trade. In 1871 he removed to Ogdensburg, Tioga county, and in 1876 settled in Blossburg, where for the past twenty years he has worked as a carpenter, In politics, he is a Republican, and in religion a member of the Methodist Episcopal church. He has held the office of P.C. of Brown Post, No. 171, G.A.R., of Blossburg, for seven successive terms, excepting the year 1894. Patrick Dwyer was born and reared in County Tipperary, Ireland, and there married Mary Ryan, a native of the same county. In 1852 he came to Pennsylvania and settled in Blossburg, Tioga county, where he worked as a laborer. When the coal mines were opened up at Morris Run he removed there, remaining four years. He next found employment in the construction of the railroad from Blossburg to Fall Brook, settling in the latter place upon its completion, and died in that borough March 8,1888, aged sixty-six years. His widow makes her home with her son-in-law, M.S. Murray, of Blossburg. She is Seventy-two years of age. They were the parents of six children, viz: John F., of Antrim; Edward P., who died September 19,1882; Norah, wife of M.S. Murray, of Blossburg; Michael, a resident of Antrim; Mary, wife of Thomas Howe, of Fall Brook, and Bridget, a resident of Blossburg. In religion, the family are adherents of the Catholic church, and in politics, supporters of the Democratic party. John F. Dwyer, eldest son of Patrick and Mary Dwyer, was born in Morris Run, Tioga county, November 6,1854. He attended the village school until ten years of age, when he commenced working in the coal mines at Fall Brook. In September, 1879, he went to Corning, New York, and found employment as a brakeman until July, 1880, when he returned to Fall Brook, and had charge of the shipping of coal for the Fall Brook Coal Company until April 1,1881. On that date he took charge of the Fall Brook Hotel, which he managed up to May 1,1888. He then removed to Antrim, where he has since conducted the Antrim Hotel, and is a successful and popular landlord. Mr. Dwyer was married June 3,1879, to Catherine Kain, a daughter of James and Elizabeth Kain, of Painted Post, New York, who has borne him seven children, as follows: John F., Edward P., who died August 19,1893; James K., Elizabeth , Mary, and Joseph (twins) and Paul. In politics Mr. Dwyer is stanch Democrat, and regarded as one of the leading members of his party in the county. He is a member of the county committee, and in 1896 was one of the Democratic congressional conferees. In religion he is a member of the Catholic church, and is connected with Division No. 2, A.O.H. He is essentially a self-educated and self-made man, and owes his business success to untiring effort and strict integrity. M.S. Murray, proprietor of the Seymour House , Blossburg, was born in County Waterford, Ireland , May 15,1858, and is a son of Patrick and Catherine ( Channahon ) Murray. He is the second in a family of six children, named as follows: John, a resident of Punxsutawney, Pennsylvania; M.S. of Blossburg; Mary, wife of M.J. Coyne, a resident of Wisconsin; William, an engineer on the Buffalo, Rochester and Pittsburg railroad; Maggie , wife of William Daley, of Detroit, Michigan and Patrick, who died October 23,1896. In April, 1864, the family immigrated to Poughkeepsie, New York, whence they remover two years later to Barclay, Bradford county, Pennsylvania, remaining there until 1887. They then located in Punxsutawney, Pennsylvania, where the father died in February, 1893, and where the mother is still living. The subject of this sketch was married September 28,1882, to Norah Dwyer , a daughter of Patrick and Mary Dwyer, and has a family of five children, viz: Mary, Edward, John, Genevieve and Francis. Mr. Murray began working in the mines when twelve years of age. In 1883 he became a clerk in the Fall Brook Company’s store and in 1887 took charge of the Fall Brook Hotel, which he managed successfully until January , 1895, when he leased the Seymour House at Blossburg, and since taking charge of the latter has largely increased its patronage and proven himself a popular landlord. In politics, Mr. Murray is a stanch Democrat, and in religion , a member of the St. Andrews’ Catholic church, of Blossburg. He is a prominent member of the A.O.H., has served several years as county president, and in 1896 was elected state vice-president of that order. Ad a business man ,he is energetic and enterprising and as a citizen, public- spirited and progressive. William F. O’Donnell, son of Richard and Mary O’Donnell, was born in Clare county, Ireland, April 10,1845. His parents came to America in the spring of 1854, and settled near Ralston, Lycoming county, Pennsylvania. In 1856 his father purchased a farm near Canton, Bradford county, Pennsylvania, which he cultivated for over thirty years. He died February 17,1890, aged ninety-one years, and his wife in February, 1885, aged eighty-five years. The subject of this sketch one of nine children, of whom but two beside himself are living , viz: Mary, widow of Daniel Downes, residing in Canton, Bradford county, and Richard, a farmer of Union township, Tioga county. Mr. O’Donnell received a common school education in his youth. At the age of fifteen he went to Fall Brook and secured employment as a woodsman. He afterwards secured the position of superintendent of of mule drivers in and about the mines at that place, filling it from 1872 to 1885. For the next three years he was engaged in supplying and conducting a meat market in Fall Brook. In August, 1888, he came to Blossburg, and bought the Yonkin House, previously run by Joseph Yonkin. He changed the name to the O’Donnell House, and carried it on until April, 1895. He then removed to Canton, intending to embark in business. In April 1896, he returned to Blossburg, purchased the Murray House, and changed its name to the O’Donnell House. This he has since successfully conducted. Mr. O’Donnell was married June 5,1864, to Catherine O’Donnell, a daughter of John and Nora O’Donnell, to which union nine children have been born, viz: Mary J., deceased; Margaret, Catherine, Elizabeth , Richard, Willie, deceased; John, William F. and one died in infancy. In politics, Mr. O’Donnell is an independent , and while in Fall Brook he served as tax collector, school director and secretary of the school; board. Mr. O’Donnell and family are members of the Catholic church. He is a member if the C.K. of A. O. H., and is looked upon as one of the progressive and enterprising citizens of Blossburg. J.D. Conners, son of J.D and Mary (Sullivan) Conners, was born in Wayland, Steuben county, New York. Hr received a common school education and when sixteen years of age left home and went to Morris Run, where he was employed in a meat market, continuing there until 1892, when he removed to Blossburg, and embarked in the wholesale liquor business, which he still carries on. He was married September 22,1890, to Anna Fogarty, daughter of Daniel and Anna (Blake ) Fogarty, to which union one child, May has been born. In politics, Mr. Conners is a Republican, and in religion, a Catholic. He is a member of the A.O.H. While a resident of Morris Run he filled the office of auditor. He has one brother, D.J. a farmer living near Curtis, New York. His mother died in 1877, and his father in November, 1892. Frank D. Andrews, was born in Wyoming county, New York, February 18, 1835. He came to Blossburg, Tioga county, Pennsylvania, July 4, 1871, and engaged in the wholesale liquor business, which he has continued up to the present time. He has ever taken an interest in the prosperity of the borough and has done much to promote its general welfare. He has been elected burgess of Blossburg four times and his previous terms were most successful in all the departments coming under his jurisdiction. The streets were permanently improved, the cross walks and culverts made of stone, the fire department well-equipped, the debt of the borough reduced and its affairs placed on an economical and business basis. The subject of water works had been agitated from time to time, without accomplishing the desired purpose. Failing to enlist the council and the people in the enterprise of putting in water works in their accounts, Mr. Andrews was largely instrumental in enlisting capital from another locality to accomplish the work, thus protecting to a large extent , the property of citizens from destructive fires and giving the people the opportunity of securing pure water for drinking and culinary purposes. Mr. Andrews is now filling his fourth term as burgess.. He is a public-spirited citizen, and highly respected for his integrity of purpose and for his interest in the public good. Francis Louis Viel, was born in France, about the year 1815, and while yet a young man, removed to the Isle of Jersey, where he married Duce LeHuquet, who bore him five children, viz: Mary Ann wife of B. Vaselin, of Blossburg; Ann, wife of Mr. Lamare, a resident of France; Francis A. of Blossburg; Elizabeth, wife of Peter Russell, of Aukland, New Zealand, and Jane, wife of Peter Bruielly, of Blossburg. Mr. Viel, who was a contractor and builder, came to the United States in 1881, and made his home with his son , Francis A., of Blossburg, Tioga county, until his death. He died March 10, 1886, and his wife, in 1884. Francis A. Viel, only son of Francis Louis Viel, was born on the Isle of Jersey, August 23,1847. He received a common school education, and served an apprenticeship to the mason’s trade. Coming to Pennsylvania in 1873, he located in Blossburg, Tioga county, where he followed contracting and building until December, 1894, when he bought out the hardware and tinsmith establishment of Miller & Russell. Mr. Viel was married January 2,1867, in the Isle of Jersey, to Ann LeVesconte, to which union there have been born four children, viz: Anna, deceased ; Florence, wife of William Besanceney, of Blossburg; Francis, and Annie. Mr. Viel is a stanch Democrat, and has filled the office of borough assessor. He is a member of the Protestant Episcopal church, and is also connected with the Masonic and Odd Fellows’ societies. He carried on a general hardware and tinsmith business up to November, 1896, and is now engaged in contracting and building. Albert Beuter, son of Frederick and Lena ( Plank ) Beuter, was born May 21,1861, in Liberty township, Tioga county, Pennsylvania. Two brother , William and Henry , and one sister, Ethel, as well as his father and mother , reside in Charlestown township; while one brother , Perry and a sister, Laura are dead. The subject of this sketch was reared on a farm, and received a common school education. In 1889 he went to Mansfield and worked in a saw-mill of Wilson Day. In 1891 he came to Blossburg, and makes teaming his occupation , devoting himself principally to delivering coal from the mine of Golden Brothers. Mr. Beuter was married in March, 1885, to Anna Clemens, a daughter of Nicholas Clemens, of Charleston township, Tioga county. They have three children: Harry, Lawrence and Frederick. In politics, Mr. Beuter is a Democrat. Nicholas Schultz, son of Andrew and Margaret ( Zimmer) Schultz , was born in Prussia, Germany, January 18, 1844, and is the oldest of three children , born to the first marriage of his father , his brother John, an engineer in the StaatZeitung building in Chicago, and himself being the only survivors. His mother died in Germany in 1851, and his father married Theresa Vietchie, a native of Baden , Germany. Jasper , the first-born of this union, and Jacob, the second are residents of Cohocton, Steuben county, New York. Mr. Schultz came to the United States in 1850, and located in Syracuse, where he was joined by his sons , John and Nicholas, who came from Germany with an uncle, a few years later. In 1861 the parents moved to Cohocton , where they still reside, the father being seventy-nine years of age. The subject of this sketch received a common school education and began life for himself as a farm hand in Herkimer county, New York, where he worked for two years. He then found employment one year with the Onondaga Salt Company, and later was a watchman for Stiles Rust, of Syracuse for two years. He then entered the employ of Franklin N. Drake, of Cohocton, remaining there until 1866, when Mr. Drake transferred him to Arnot, Tioga county, Pennsylvania, where the coal mines were then being opened up. At the time Mr. Schultz located in Arnot there were but three houses in the place . He went to in the saw-mill as head sawyer and saw setter, continuing there fir three years, when he was given the position of saw filer, which he filled until 1881, when he was made outside foreman of the mills at Arnot, a position he has since filled in a satisfactory manner. Mr. Schultz was married in July, 1869, to Margaret Muntz, a daughter if John Muntz, of Cohocton, New York, and is the father of seven children, named as follows: John, a resident of Cohocton; Margaret, deceased; Frank, Flora, wife of James Creighton, of Arnot; William, Nora, deceased, and Ray. In politics, Mr. Schultz is a Democrat, and in religion, a member of the Catholic church, of Arnot. He is also a member of the Father Matthew Branch of the C.K. of A., of Blossburg. Matthew A. Blair, son of Walter and Elizabeth (Allen) Blair, was born in Cumbernauld, Scotland, March 13,1855, and is one of eight children, three of whom are living. James , the fourth born, is a physician in Groton, New York, and Walter, the youngest, is a clerk in the employ of the Blossburg Coal Company at Arnot, Tioga county. The others died in early youth. In 1869,Mathew A. and his father came to Pennsylvania and settled in Arnot, Tioga county, where they found employment in the mines. In 1870his mother , with the remainder of the family, joined them. His father died in October, 1876, aged forty-five years, but his mother is still living. Mr. Blair received a common school education in Scotland. At eleven years of age he went to work in the mines, and followed coal mining until September, 1884, when he entered the store of the Blossburg Coal Company, in Arnot as a clerk, which position he filled until 1888. He was then placed in charge of the company’s store at Landrus, where he remained until August 1893, when he returned to Arnot, and with Mack Scudder, took charge as manager of the stores of W.W. Bradbury Company. Mr. Blair was married January 11, 1884, to Nettie Mitchell, daughter of James G. and Mary Mitchell, of Arnot, to which union have been born five children, viz: Walter, James, Nellie, Ethel, and Mary. In politics, Mr. Blair is a Republican. . During his residence in Landrus he served as postmaster, and filled the offices of town clerk and school director. He is member of the Presbyterian church and also of Bloss Lodge, No. 350, F. & A.M., and of Arbon Lodge, No. 489, I.O.O.F As the result of a practical experience of nearly thirty years, Mr. Blair is thoroughly acquainted with all the details of coal mining , and by industry and an intelligent discharge of the responsible duties of his various positions, has merited his successive promotions. D. C. Waters, physician and surgeon, was born in Cortland county, New York, April 26,1842, and is a son of Aretus and Caroline Waters. His parents had a family of twelve children, named as follows: Eunice and Sarah, both of whom died in infancy; Alexander, a resident of Cortland county, New York; Merton, who died May 22,1894; Albertus, a resident of Nebraska; Oscar, who resides at Lansing, Michigan; Orson, who lives in Truxton, New York; Alvah D., who died May 21,1870; Henry, a resident of Cuyler, New York; D.C., a physician of Arnot; George , who lives in Australia, and Emily, wife of James Blanchard, of Baltimore, Maryland. The father died November 17,1869, aged eighty-seven years, and the mother May 30,1876, aged eighty-seven years. The subject of this sketch was educated in the common schools and at the State Normal School, Cortland, New York. In the winter of 1859-60 he attended lectures at the Medical College , Georgetown, D.C. On May 9,1861, he enlisted in Company H, Twelfth New York Volunteers and on December 9, of the same year, he was transferred to Mt. Pleasant Hospital, Washington, D.C., where he filled the position of hospital steward until August 1,1862, when he joined Company E, One Hundred and Fifty-seventh New York Volunteers. The following December he was again transferred to Mt. Pleasant Hospital, where he filled the position of acting surgeon until discharged August 28,1865. He soon after resumed his medical studies, and attended Georgetown College, from which he graduated March 4,1867. Sixteen days later he began practice in Scott, Cortland county, New York , where he continued until November 21,1870, when he removed to Arnot, Tioga county, Pennsylvania, where he has since resided and practiced medicine. Dr. Waters was married November 1, 1868, at Knoxville, Tioga county, to Miss Sue Brown, a daughter of Rev. J.W. Brown. They are the parents of the following children: Nellie, wife of Seth Palmer, of Baltimore, Maryland; Blanch, who died October 23,1890;John W., Montgomery, Gladys and Happy, all of whom are dead. In In politics, Dr. Waters is a Republicans, and is now serving his fifth term as justice of the peace. He has also filled the office of school director. The family are members of the Presbyterian church, and he is connected with the K. of P., of Arnot; Bloss Lodge No.350, F.& A.M.; Winterview Castle, No. 220, K. of G.E., of Arnot, and Brown Post, G.A.R., of Blossburg. Dr. Waters has built up a good practice and ranks among the skillful physicians of the county. He enjoys the respect and esteem of the people of Arnot, among whom he has lived and practiced his profession for a quarter of a century. J.W. Jackson, son of Charles and Elizabeth Jackson, was born in Cornwell, England, September 17,1859. In 1869 his parents came to Pennsylvania and settled in Burlington, Bradford county remaining there until 1870, when they removed to Blossburg, Tioga county, where they now reside. The subject of this sketch is the eldest of four brothers. Charles E., resides in Binghamton, New York; David R., in Elmira, and Alfred T., in Blossburg. Mr. Jackson received a common school education , and learned the trade of a painter and paper hanger, under his father. He later entered the drug store of Dr. Williams, of Blossburg, and remained with him and his successor , Stewart Brothers , between one and two years. He also clerked in the drug store of Ingram & Palmer and their successors for several years. In 1880 he embarked in the drug business for himself, in the store now occupied by Schofield & Babcock, of Blossburg. He next went to Springfield, Illinois, where he followed painting until 1882, then returned to Blossburg, and bought out Stincoman & Company , painters and paper hangers. In 1884 he took charge of the drug store of the late Stephen Bowen, remaining until February 1886, when he went to Arnot to take charge of the drug department of the Blossburg Coal Company’s store, now the store of W.W. Bradbury Company, which position he has since occupied , and has discharged the duties thereof in a capable and efficient manner. Mr. Jackson was married April 9,1883, to Minnie M. George, a daughter of Griffith George, of Springfield, Illinois, to which union have been born four children, viz: Percy H.; Roy W.; Edward G. and Alfred J. In politics, Mr. Jackson is a Republican, and has served as a member and treasurer of the school board. He is P.N.G. of Arbon Lodge, No. 489, I.O.O.F. of Blossburg ; also P.H.P. of Enterprise Encampment, and a member of Bloss Lodge, No. 350, F. & A.M., of the same place. Frank H. Welch, son of Jefferson and Lucy Ann (Palmer) Welch, was born in Sullivan township, Tioga county, Pennsylvania, July 18,1852, and is a descendant of pioneer families of the county. He is one of eight children, his brothers and sisters being named as follows: Jane, deceased wife of Horace Scott; Mary, wife of Horace Welch, of Windfall, Bradford county; Stephen ,Lanson and Charles, all deceased; Bert, a resident of Blossburg, and Willis, who resides in Mansfield. The father died in April, 1889, in his sixty-ninth year. His widow, who was born November 25,1821, resides near Mansfield, Tioga county. Frank H. was reared in Sullivan township and attended the common schools of his district. He remained on the farm until he was twenty-four years of age, when he entered the employ of the Blossburg Coal Company, as a woodsman, and later clerked in the company’s store at Arnot. In 1889 he took charge of the Arnot Hotel. And in September, 1892, bought out the livery stable and undertaking business at that place , both of which he now carries on in connection with his hotel. Mr. Welch was married December 13, 1876, to Anna E. Months, a daughter of John Months, and a native of Danville, New York , who bore him one son, Clyde. She died November 7,1896, aged forty-seven years. In politics, Mr. Welch is a Democrat, and is a member of the K. of P., of Arnot, and of Arbon Lodge, No. 489, I.O.O.F., of Blossburg; also of Enterprise Encampment. Mr. Welch is a genial, affable gentleman and is well liked both as a business man and a citizen. George Watson, son of Peter and Catherine (Rogers) Watson, was born in Middleton, Orange county, New York, May 37,1852, and is the oldest of six children, the other members being as follows: Maggie, wife of Elias Schultz, of Avoca, New York; Kate , deceased; Andrew, a resident of Sayre, Pennsylvania. Agnes, who resides with her mother in Waverly, New York, and Peter, a conductor on the Lehigh Valley railroad, who resides in Sayre. The father died February 20,1867. Mr. Watson has followed lumbering since arriving at manhood. In 1883 he came to Arnot, Tioga county, and entered the employ of the Blossburg Coal Company. Two years later he was made foreman of the company’s foreman of the company’s saw-mill at Landrus, a position he has since filled. On October 8,1873, Mr. Watson was married to Annie Clark, a daughter of Patrick Clark, of Addison., New York, to which union have been born nine children, viz: John, Peter, Edward, Mary, Albert, Bessie, George, Nellie and Curtis. In politics, Mr. Watson is a Democrat, and has served as township supervisor one term. He has also represented his party as a delegate to county conventions, In religion, he is a member of the Catholic church. Years of experience in the woods and in the mill, have given Mr. Watson a thorough knowledge of the lumber business , and has thoroughly equipped him for the discharge of the duties of his present position. He has proven himself capable and competent and is popular with the men associated with him. Mack Scudder was born in Prattsville, Greene county, New York, May 22,1842. His parents, Daniel and Irene ( Tole) Scudder, were natives of Delaware county, New York. In 1848 the family removed to Equinunk, Wayne county, Pennsylvania, where his father built a tannery, which he operated until 1859, and then removed to Middleburg Center, Tioga county, Pennsylvania. In 1863 he settled in Elmira, New York, where he died in March, 1886, aged seventy-six years. His wife died in July, 1873, aged fifty-four years. The subject of this sketch was one of eleven children, six of whom grew to maturity, as follows: Sarah A., widow of Solomon Bennett, of Elmira: George P., who was first lieutenant of Company F, Forty-fifth Pennsylvania Volunteers, and was killed at the battle of Cold Harbor, and Charles T., deceased. In his youth Mr. Scudder received a common school education, supplemented by a course at Knoxville Academy. He acquired a practical knowledge of business as a clerk in Equinunk, where he served behind the counter three and one-half years. He afterwards clerked in Elmira, a portion of which time he was employed by a lumber firm as inspector and accountant. From 1870 to 1873, he was employed in McIntyre’s store at Ralston, Lycoming county, and then until the fall of 1876, with Col. J.S. Bates, of Driftwood, Cameron county, in the mercantile business. In the autumn of 1876 he became yardman of the Tioga division of the Erie railroad, at Elmira. On June 19,1893, he became manager of the W.W. Bradbury Company’s store at Arnot, Tioga county, as the successor of W.W. Bradbury, deceased, which position he held until August 1,1896. Mr. Scudder was married December 20,1866, to Maria L. Lord, a daughter of Freeman A. and Abbie Lord of Hancock , Delaware county, New York. Eight children have been born to this union, viz: Sarah Libbie, a graduate of the public schools in Elmira; A. Irene, a graduate of the public schools of Elmira, and of the State Normal School at Cortland, New York; Maria Lord, a graduate of the public schools of Elmira, and the Elmira College; Joseph M., employed in the electric plant at Landrus, Tioga county; Daniel F., a clerk in the office of the Blossburg Coal Company at Arnot; Theodore, Georgia and Wheeler. In politics Mr. Scudder is a Republican, and in religion a member of the Protestant Episcopal church. He is also a charter member of Driftwood Lodge, F. & A. M., of Driftwood, Pennsylvania, having been a Mason of Hancock Lodge, Hancock, Delaware county, New York, in 1865. Thomas Driscoll was born in Ireland, and came to Canada in 1837, locating near Toronto, where he followed the occupation of a laborer. He married Ellen Connelly, also a native of Ireland. To which union were born eight children, viz: Michael and Patrick, residents of Morris Run; Dennis and Thomas, both deceased; Mary, a sister in St. Joseph’s Catholic Hospital, at Erie, Pennsylvania; James, who resides in Morris Run; John a resident of Blossburg, and Ellen, wife of Daniel Duggan, of Morris Run; In the fall of 1838 Mr. Driscoll removed to Mt. Morris, New York and two years later to Corning, where he lived four years. He next located at Blossburg , Tioga county, Pennsylvania, where he was employed as a coal miner until 1854, when the mines at Morris Run were opened up and he removed to that place. He continued coal mining until 1861, then bought a farm in Ward township, upon which he passed the remainder of his life, dying February 9,1893, aged eighty-six years. His widow resides in Morris Run, with her son-in-law, Daniel Duggan, and is now in her eighty-third year. Michael Driscoll, eldest son of Thomas Driscoll, was born near Toronto, Canada, July 17, 1838. He received a common school education and early became an employ in the mines at Blossburg and Morris Run. He has worked in Morris Run since the opening of the mines in 1854. In 1879 he was made foreman of the Jones mine, a position he still holds. It is one of much responsibility, which he has filled to the satisfaction of the company, and at the same time has made himself popular with the men under him.. He is regarded as one of the best practical miners in this section of the State. Mr. Driscoll was married October 17,1865, to Mary Duggan, a daughter of John and Mary Duggan, of Morris Run, and has nine children, viz: Ella, Mary, Thomas, Hannah, Kate, Anna, Alice, Elizabeth, and John. In Politics Mr. Driscoll is a Democrat and has served four years as township assessor, three as constable, and a number of terms as school director. In religion he is a Catholic, and is a member of Branch, No 30, C. K. of A., of Blossburg. Mr. Driscoll is one of the leading citizens of Morris Run, and is known as a man of strict integrity and high character. George Davis was born in Old Park, Shropshire, England, and was a son of Mark Davis. He learned the painter’s trade in his native land, and in November, 1863, he came to the United States, being accompanied by his parents and other members of his family, and located at Bloomsburg, Columbia county, Pennsylvania. Here he remained two years, during which time his father died. In the fall of 1865 he removed to Morris Run, Tioga county, and entered the employ of the Morris Run Coal Company, working at his trade during the summer and in the mines during the winter seasons. A few years after his settlement in the Morris Run, his mother died. For several years he carried mail between Morris Run and Fall Brook. In 1878 he opened a hotel in Morris Run, which he carried on until his death, December 17, 1892, aged fifty-three years. Mr. Davis was married in England, January 27,1860, to Sarah Ann Tipton, a daughter of Isaac and Susanna Tipton, to which union eight children were born, viz: Julia, wife of W.C. Fairman; Ruth, widow of A.D. McKenzie; William and Mark residents of Blossburg; Emma M. deceased; Bertha M., a graduate of State Normal School at Mansfield, and now a teacher in the public schools; Frederick G., a graduate of the same institution, and a student in the Philadelphia Dental College, and Ralph T., a student at the State Normal School, Mansfield. In politics, Mr. Davis was a Republican, and served for a number of years as justice of the peace of Hamilton township. He was a member of the I.O.O.F., K. of P. lodges of Morris Run, and of Lodge No. 350, F. & A.M., of Blossburg. Mrs. Davis and her unmarried children live in Morris Run, and enjoy a comfortable competence left by a kind husband and father. James C. Hadley was born in Dudley, Worcestershire, England, May 26,1852, immigrated to Pennsylvania in September,1873, and located in Morris Run, Tioga county, where he followed the occupation of a coal miner. In July, 1880, he went west, and for the next three years followed coal mining in Ohio, Iowa, Illinois and Wyoming. In April, 1883, he returned to Morris Run, and resumed working in the mines. On November 7, 1893, he was promoted to mine foreman, a position which he still holds. He is one of the valued and trusted employes of the company, and earned his promotion by years of faithful and efficient service. Mr. Hadley, was married October 16,1870, to Roseanna Bennett, a daughter of Isaiah and Rebecca Bennett, of Dudley, Worcestershire, England. Twelve children have been born to this union, four of whom are living, viz: William, James B., Benjamin R., and Mary Gertrude. Mrs. Hadley died March 18,1893,aged forty-two years. In politics, Mr. Hadley is a Republican and has been secretary of the township school board for six years. He is a member of Morris Run Lodge, No.350, F. & A.M., of Blossburg. Mr. Hadley is not only practical miner, but is well informed on matters of public interest. He has a valuable private library, and is conversant with the standard works of English literature. Edgar A. McEntee was born January 4, 1857, in Leroy, Genesee county, New York, and is a son of Owen and Kate (Hand) McEntee, native of County Louth, Ireland. His parents came to Genesee county, New York, in 1851, where his father followed farming until his death, March 20, 1895, aged seventy-five years. His mother died August 15,1891, aged seventy-two. They were the parents of the following children: Mary, deceased wife of Nicholas Clemens; Annie, wife of George Wilson of Mansfield; Maggie, wife of Henry Priset, of the same place; William and Thomas, both deceased; Edward and Edgar A., twins, the former a resident of Corrinna, Michigan, and the latter a resident of Fall Brook; Frank, who lives in Montana, and Eugene, who resides in Leroy, New York. The subject of this sketch received a common school education, and in early manhood engaged in lumbering, working four years in different saw-mills in Charleston township, Tioga county. In April, 1880 he went to Colorado and continued the same business between Denver and Leadville. In July, 1886, he went to Arkansas, where he was employed in saw-mills until September, 1887, when he came to Fall Brook, Tioga county, and worked in the saw-mill for a time. He then was promoted to the position of outside foreman which he still holds. Mr. McEntee was married June 6,1888, to Mary Adams, a daughter of Robert Adams, of Charleston township, and has three children: Leone and Ione, twins, and Edna May. In politics, Mr. McEntee is an ardent Democrat, and has served in the council of Fall Brook and three terms as burgess of that borough. He is a member of Bloss Lodge, No.350, F. & A.M., of Blossburg. Mr. McEntee is one of the most popular citizens of Fall Brook and a faithful and efficient employe of the company. Stephen H. Wood was born in Montgomery county, New York, November 23,1824, a son of Hezekiah and Mary (Adamy) Wood, of that county. He was reared in his native town and February 15,1849, he married Mary Jane Owen, a daughter of Daniel and Rhoda Owen, of Tompkins county, New York. A year after their marriage they removed to Granville, Bradford county, Pennsylvania, where they lived until March, 1852, when they came Tioga county and settled on the farm in Bloss township, now the residence of their son, Harvey D. The land was then covered with the primitive forest, in the midst of which Mr. Wood erected a frame house, one of the first in that part of the county. Here he lived clearing and tilling his land until his death, September 7,1887, leaving one son Harvey D. Three daughters, Rhoda, Elmina C. and Clara Adel, died in early youth. He was a good farmer, owned nearly 300 acres of well-improved land and was one of the prosperous, progressive and leading agriculturists of the county. Mr. Wood was a stanch Republican, in politics, and in religion, a member of the Methodist Episcopal church. He served nine months in Company A, One Hundred and Seventy-first Pennsylvania Militia, and was a loyal, patriotic citizen. His widow resides in Mansfield. Harvey D. Wood was born in Bloss township, Tioga county, Pennsylvania, December 11,1864, and is a son of Stephen H. and Mary J. (Owen) Wood. He was educated in the common schools and at the State Normal School, Mansfield, from which he graduated in 1884, and subsequently taught school a few years. On August 22,1888, Mr. Wood married Jennie Callender, of Peckville, Lackawanna county, Pennsylvania, and has two children, Stephen R. and Harvey Dwight. In politics, he is a Republican, and has served one term as township assessor. Besides the old homestead on which he resides he owns a farm of 100 acres across the line in Charleston township, the two making a valuable property of 386 acres. Mr. Wood is one of the leading farmers of the township, and is a man of education, enterprise and public spirit. Selah Phillips was born in North Wales, October 1,1836, son of Phillip and Elizabeth Phillips. In 1866 he came to Blossburg, Tioga county, Pennsylvania, but soon after went ti Brookville, Ohio, where he worked as a coal miner for three years. He then returned to Tioga county and worked in the coal mines at Arnot until 1888, when he moved to his present farm of thirty acres of land in the northwest part of Bloss township, which he bought in 1878. Here he opened a general store, which he has since carried on in connection with the cultivation of his land. Mr. Phillips was married in Wales, March 5,1859, to Elizabeth Turner, a daughter of James and Ann Turner, to which union have been born six children, viz: Elias and Thomas, who reside at Lemont Furnace, Fayette county, Pennsylvania;; Mary Ann, wife of William Powell, of Blossburg, Tioga county; Elizabeth, wife of David Williams , of Edwardsdale, Pennsylvania, and James and David, both of whom reside at home. Mr. Phillips is a stanch Republican, and has served as treasurer of Bloss township. He is a member of the Baptist church, and also of Arbon Lodge, No.489, I.O.O.F., of Blossburg. He is a quiet, unassuming man, whose life of industry and integrity has won for him the respect of all who know him. John E. Henry was born in Charleston township , Tioga county, Pennsylvania, June 11,1833, and is a son of James and Nancy Henry. His father was a native of New Hampshire, and came with his parents to Charleston township, at an early day, where he died in 1849, aged sixty years. His mother died in 1871, aged sixty-seven years. They were the parents of the following children: Lydia J., wife of Jacob Johnson, of Delmar township; Eliza, deceased wife of Venus Crowl, of the same township; Amanda, deceased wife of Tunis Bush, of Gaines township; John E., Rosalie, deceased , who was twice married , first to James Bush, and afterwards to James Hakes; Chloe, wife of Ben Carson; James H., a resident of Prescott, Pierce county, Wisconsin; Orville, deceased and Richard, a resident of Potter county. John E. was reared in Charleston township, and on March 18,1864, he enlisted in Company A, One Hundred and Eighty-seventh Pennsylvania Volunteers, and served until May, 1865. His brothers, Orville and Richard were in the same company and regiment. Mr. Henry was married May 10,1854, to Hannah Kimball, daughter of Lazell Kimball, of Charleston township, to which union have been born three children, viz: Geraldine, wife of Charles Patterson, of Hornellsville, New York; Josephine, who died in infancy, and Charles M., who lives on an adjoining farm to his father’s. In politics, Mr. Henry is a Republican, and has filled the office of school director. He is a member of the Grange at Round Top, and of George Cook Post, No.315, G.A.R., of Wellsboro. Mr. Henry is the owner of a well-improved farm in Bloss township of 100 acres, and is one of the leading farmers of this section of the county.